Beau Brummell, the arbiter of fashion in Regency England, was a good friend of the Prince Regent, the future King George IV. Both men loved fashion, although Brummel favoured and made fashionable a sober style of clothing, while the Prince preferred luxurious outfits in bright colours. The Prince Regent also liked Brummell’s personality: he knew how to tell a story, was a good conversationalist, and was very witty. His sarcastic remarks were, however, sometimes too honest and brutal and, in the end, some of them may have ruined their friendship. Not Withstanding the great disparity of rank, the intimacy that was formed between Brummell and the Prince of Wales continued for some years uninterrupted. He was a constant guest at Carlton House, and was distinguished by many marks, never pecuniary ones, of his royal friend’s partiality for him. At length, however, a rupture took place, but it was not caused by the circumstance to which it is usually attributed. The story of” Wales, ring the bell!” was always denied by Brummell: indeed, he seemed indignant at its being generally credited; and I have heard him, in explanation of the subject, say, “I was on such intimate terms with the prince, that if we had been alone I could have asked him to ring the bell without offence; but with a third person in the room I should never have done so; I knew the regent too well.” The vulgar impudence of the action itself, without Brummell’s denial of it, makes the anecdote extremely improbable; and he was also too good a judge of his own interests, to run the risk of being turned out of the prince’s society for the mere fun of enacting such a piece of tomfoolery. Another version of the story is, that one evening, when Brummell and Lord Moira were engaged in earnest conversation at Carlton House, the prince requested the former to ring the bell, and that he replied without reflection, ” your royal highness is close to it;” upon which the prince rang the bell and ordered his friend’s carriage, but that Lord Moira’s intervention caused the unintentional liberty to be overlooked. Brummell, as well as his friends, attributed his quarrel with the Prince of Wales to a series of sarcastic remarks, in which he had indulged at the expense of Mrs. Fitzherbert; indiscretions that he was led into by foolishly espousing the part of a noble lady, her rival: but his talent for ridicule once enlisted in her cause, he did not spare even the prince himself. There was at that time a burly porter at Carlton House, nicknamed ” Big Ben,” who was so tall that he could look over the gates, and as the regent was then increasing in size, Brummell often designated the master, by the appellation of the servant— and Mrs. Fitzherbert, by that of “Benina.” It is also said, that he annoyed her by various remarks of the same kind; and that, when desired by the regent, at a ball at Lady Jersey’s, to call her carriage, he obeyed, but in doing so, substituted the word mistress for the usual one of Mrs., and laid a strong emphasis on the insulting epithet. If this anecdote is true, no wonder that, when it came to the lady’s ears, as well as the prince’s, with the allusions to their embonpoint, (upon which subject they were, as people frequently are, extremely sensitive,) such ill-timed jokes were resented; and that Brummell was dismissed: — he always, however, considered that the continuation of the regent’s anger was owing to Mrs. Fitzherbert, whose absurd vanity in identifying herself with the crown of England—for it was that or nothing—made her peculiarly unforgiving on this subject; and her dislike to Fox renders it probable that Brummell’s opinion was correct. Moore, however, in a parody on a celebrated letter from the prince regent to the Duke of York, on the 13th of February, 1812, gives the former the credit of all the indignation against Brummell, and adduces another well-known mot of the Beau’s as the reason of it. But, whatever the causes of offence may have been that led to the quarrel, the Beau treated the affair with his usual assurance; and waging war upon his royal adversary, assailed him with ridicule in all quarters, and affected to say, that he had himself cut the connection: it was in this spirit, no doubt, that he said to Colonel McMahon, “I made him what he is, and I can unmake him.” Of course, after this break, the regent determined to take advantage of the first opportunity that occurred, of showing the world that he was no longer anxious to continue the acquaintance. An occasion for his so doing presented itself not long after in a morning walk, when the prince, leaning on Lord Moira’s arm, met Brummell and Lord A, coming in the opposite direction, and, probably with the intention of making the cut more evident, his royal highness stopped and spoke to his lordship, without noticing the Beau—little thinking that he would resent it; great, therefore, must have been his surprise and annoyance, as each party turned to continue their promenade, to hear him say in a distinct tone, expressive of complete ignorance of his person, ” A, who s your fat friend?” But Brummell was sometimes in a humour to adduce other reasons than the right one for the fracas, which led to his final rupture with the regent, and the favourite fiction that he then palmed upon his most eager listeners was, that they had been rivals in a love affair, in which the prince was of course the unsuccessful suitor. 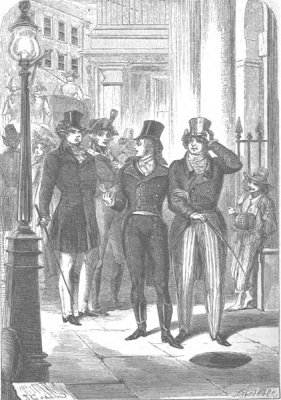 When Brummell found that his royal highness had really closed the doors of Carlton House against him, he cultivated with greater assiduity the friendship that had always existed between himself and the Duke of York, who was never known, in good or ill report, to desert a friend; and his conduct, and that of the duchess, to the Beau in his exile*, were striking instances of the steadiness and sincerity of their friendship. *Beau Brummell had to flee England in 1816 due to his heavy gambling debts.